JCAT Youth presents "The Addams Family, A New Musical"
Based on the cartoon characters created by Charles Addams, this Broadway hit musical brings the macabre and charming characters to the JCAT Stage. With a twist on the usual “Boy meets girl” story, this fun and tune filled show is an eerie romp through the world of Gomez, Morticia and the whole Addams clan. Fun for the whole family! JCAT is the performing theatre of the Michael-Ann Russell JCC, a year-round program for youth, teens, and adults, where participants are part of a magical world of theatre, with a full season of productions, theatre camps, and a wide range of classes and workshops in acting, improvisation, and technical theatre. JCAT is committed to challenge, enlighten, educate, and entertain its audiences through its multi-tier program. Scheck Hillel Community School has opened applications for multiyear academic scholarships of up to 100% full tuition for rising Grade 9 and Grade 10 students, reinforcing that Scheck Hillel is the school for high achieving students with a passion for academic excellence and a desire to nurture their Jewish identity. At the highest level, a rising Grade 9 student can be recognized with a scholarship throughout all four years of high school. "With this exciting new offering of multiyear scholarships, we are celebrating academic achievement and increasing student opportunity, reflecting Scheck Hillel's commitment to our rising generation of dreamers, innovators and leaders," said Vanessa Donaher, Head of School. To be considered for a Fall 2019 scholarship, students may apply online at eHillel.org/scholarship or call 786.279.1661 to learn more. Scholarship testing will be held Sunday, December 9, on the Scheck Hillel campus. To maintain an academic scholarship, a recipient must uphold a weighted GPA of 4.0 in all math and science courses. Scheck Hillel Community School educates and inspires students 18 months-Grade 12 to become exemplary global citizens with enduring Jewish identity and values through an individualized college preparatory curriculum highlighted by STEM and design, Capstone, college dual enrollment, arts, athletics and community service. Its 14-acres include a 115,000-sq.-ft athletic complex with additional expansion plans. 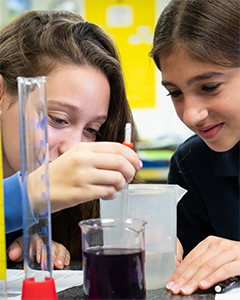 Set within a nurturing, diverse community, Scheck Hillel is one of the world's largest Jewish community day schools and a National Blue Ribbon School of Excellence. For more information about Scheck Hillel Community School or to arrange a visit to the school, please contact our Admissions office at 305.931.2831x173 or write to admissions@eHillel.org. As America commemorates Pres. John F. Kennedy's assassination in Dallas, Texas (November 22, 1963), Prof. Jerome Chanes of the Center for Jewish Studies at CUNY's Gradate Center discusses the profound positive impact President Kennedy had on U.S.-Israeli relations. Join guest speaker, US Air Force Chaplain, Capt Rabbi Eli Estrin, as we celebrate the Rosh Hashana of Chasidism with an inspiring dinner farbrengen. For men & Women. No charge. Win $10,000.00 CASH + other great prizes, while supporting Dade County's only daily Jewish afterschool program! Join Jewish Young Professionals for Miami’s premier, annual Chanukah celebration. Featuring an open Vodka and Latke Bar, Live-art performance and a dreidel pool. This year’s Vodka Latke will be a non-stop party at Cameo on Miami Beach. Open Vodka Bar Open Latke bar Cash Bar Art presentation And introducing our dreidel photo pool.